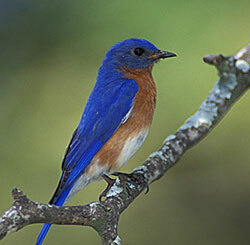 The eastern bluebird is found throughout New Jersey in appropriae habitat. Some bluebirds will over-winter in the state. Bluebirds are usually found in fields, open woodlands, parks or along golf courses or other open areas, including suburban locations with open spaces and scattered tress. The eastern bluebird has a musical flight call that often reveals its presence. The eastern bluebird nests throughout New Jersey in appropriate habitat. One or two broods may be produced. Three to five light blue eggs are typical. Visit the main Birdzilla.com Web site for information on nest boxes and management, bluebird trails, range maps and much more on these popular birds. The Sam's Guide to Bluebirds CD-ROM and DVD provides complete information on bluebird trails, boxes, care and feeding and a whole lot more.